This is the fourth of our 2019 series of intimate “Concerts with Conversation” in Riffe’s Meeting House next to the Hotel. In a “house concert” setting for a maximum of 40 people, world class musicians let their hair down and play for the fun of it before an appreciative Sunday afternoon audience. Coffee and cookies are served. Admission is $25 + tax and tickets may be purchased at the Hotel front desk or by calling (707) 275-2244 ext. 0. 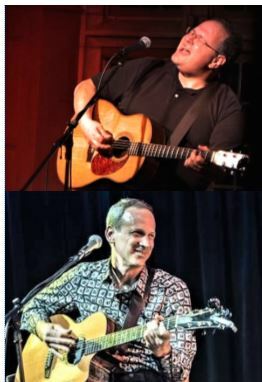 Today’s concert features Grammy nominated songwriter and performer STEVE SESKIN backed on guitar by DAVID LANDON. Steve Seskin is prolific American songwriter whose compositions have been recorded by Kenny Chesney, Peter Frampton, Waylon Jennings, Tim McGraw and many others. Seskin grew up in New York and began his songwriting career in San Francisco in 1972. Since then, he has since split his time between California, Nashville and touring. An engaging performer in his own right, Seskin has recorded numerous CDs for his own label. David Landon is a singer, songwriter and guitarist who brings over 20 years of experience from the stage and studio to every note he plays. In the early days of David’ professional career (circa 1990), he lived and performed in Paris, France where he was a steady fixture in the European club and festival circuit. year. Though life in Paris was truly wonderful for the American ex-pat / musician, David returned to the US in 1995 to further pursue his musical vision. Since his return to the US David has released 5 solo c.d.s and has played on countless recording sessions. He has performed in a multitude of venues across the US. Including our Blue Wing Blues Festival.